Alnwick has to be my favourite Harrier League destination. It was where I made my Harrier League debut and has the most amazing backdrop of the imposing Alnwick Castle. At the same time, it has deep mud, a hill that seems to go on forever, upwards of course, a classic forest section and a downhill so steep that skis would be preferable to spikes. And all of this three times. I think marathon training is starting to take its toll on both my body and motivation. And with other things going on at work and at home, an important race on this particular day was not great timing. And that dictated my mood and mental focus on Saturday 4th March. With relegation from Harrier League Division 1 all but certain, there was still an impressive turnout from the Gosforth Harriers men’s team. Just prior to the race, we witnessed the boys u-13s win their title and the senior women gain a well-earned promotion to Division 1 in addition to a load of other fantastic performances, so we went into the race with heads held high. My 3rd and 4th toes on my right foot, on the other hand, were less than impressed at putting on a tight and not so comfortable pair of spikes and running 6.2 miles on a wet and rough surface. I have had a pressure sore on my 4th toe of my right foot for a few years now. It always rubs against the bony part of my particularly bony 3rd toe whether I am running or walking and it is particularly bad at the moment. I have plasters, gels etc., but nothing seems to cure it. Running with pain creates all sorts of issues in your gait and running style, so I was hoping the pain would, as usual, be consumed by the effort of the race and disappear, at least subconsciously. My warm-up reflected my mood and I was just hoping the race itself would spark the motivation. With torrential rain the previous night, the fear was that the course would resemble something like Knowsley or Thornley Hall Farm, but that was not the case. The ground had held up remarkably well, although there was still plenty of sloshing and squelching. The weather was mild with no wind. Perfect conditions, you might say. A last-minute issue of my Garmin not picking up a satellite signal until the second before the whistle went to set off the medium pack was the least of my worries as I struggled to cope with the early pace. My heart rate was off the charts, indicating an inadequate warm-up, and I struggled to control it even though I didn’t feel like I was going at breakneck speed. I used the first downhill to the lowest point on the course to both pick up the pace and get into a rhythm. As usual, I picked my targets, a younger runner from Heaton and an older runner from Sedgefield. That definitely provided the motivation to maintain a decent pace. Unlike other cross-country events, there were few markers that you had to keep within, which meant a wide course providing plenty of less muddy route options. Surprisingly, most runners kept on the main path that was increasingly cut-up. Starting from medium pack, the first lap was very congested, especially through the fairly narrow forest track, as I picked my way through the slow pack of the 500+ field. 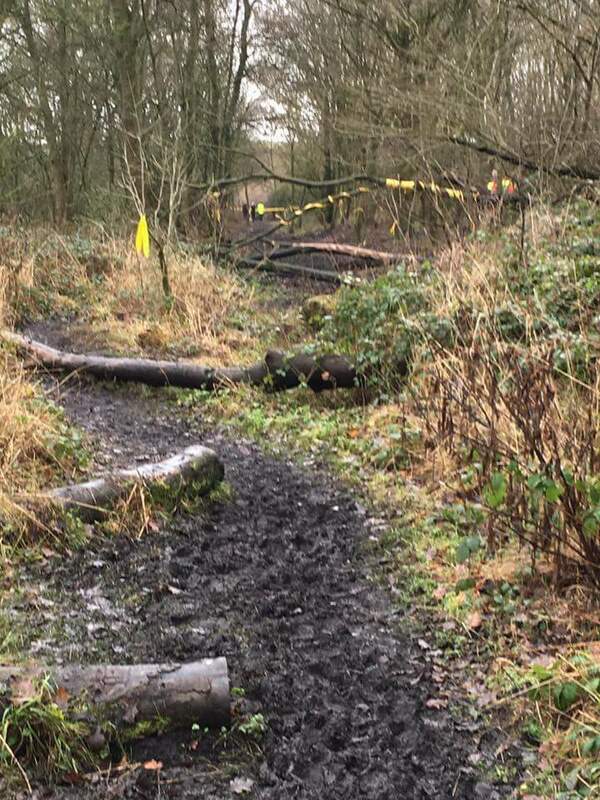 A few fallen trees to hurdle, over-hanging branches to avoid and decisions whether to take slightly longer routes off to the side to avoid the worst of the mud. Through the forest, a sharp right, jump down a few natural steps avoiding trees and roots, a sharp left and onto the downhill section. I think I am pretty good at running downhill, but it amazed me how some people were speeding past me on the really steep section. Past the start/finish area and onto lap 2. Less congestion now and a clearer run. One of my targets was now slightly ahead of me, but I caught him on the first downhill and the three of us remained very close throughout lap 2. The Sedgefield runner was continually breaking about the only rule of cross-country – to stay on the course where the markers instruct you to do so. This meant he gained an advantage by having a smoother run and cutting a few bends. A Saltwell Harrier shouted at him to stay on the course, but he continued to do it. Nevertheless, I felt good throughout lap 2; no pain from my toes and making decent progress through the field. Lap 3 is where true strength, stamina and conditioning shine through, but this was where I failed to keep up with both my targets. It was on the second part of the long uphill that I lost them. Passed and encouraged onwards by a Gosforth fast-packer, I tried to pick the pace up going through the forest when this photo was taken, but my Garmin indicated that lap 3 was 30 seconds slower than lap 2, which was 20 seconds slower than lap 1, even though I felt lap 1 was a struggle. Out of the forest and onto the final steep descent before a 100 yards or so to the finish line, I put everything into it. I was only overtaken by a fast-pack runner and managed to get within two seconds of one of my targets and nine seconds of the other. Going down the finishing funnel, my eyes were scanning those already finished for the green and white stripes of the Gosforth team. I counted six already finished, meaning that, for the first time in my Harrier League career, as the seventh runner back, I didn’t count for the team. At first I was disappointed, but then realised that the team must have put in a really strong performance. Some slow-packers that I had passed at Thornley had stayed ahead of me here. All credit to them. Indeed, as a team, we had our third 6th-place finish of the six races this season, which was not enough to avoid relegation from the division of ten teams with two going down. Despite our consistency, indicative of a core group of athletes who turn out race after race, it shows that we are a small club compared to the big boys in Division 1 who can put out several teams and still have some really fast guys starting their first Harrier League race from slow pack to post a low score. We have the highest average number of appearances per runner of any team in Division 1 (3.4 out of 6) from the fewest number of individual runners (25). A tribute to both the team and the team captain. 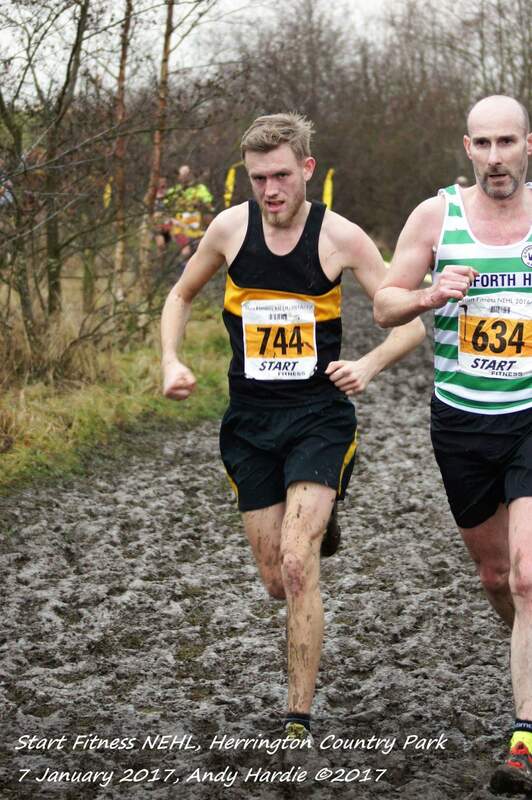 The Harrier League and the various regional and national cross-country events are a main element of the year for Gosforth Harriers with encouragement for everyone to participate and we do better than our size suggests we should. The ladies and girls are Davison Shield Champions; the men and boys came second in the Sherman Cup; top 5 performances in almost every age group for both girls and boys teams in the Harrier League; senior and vet women promoted to Division 1; senior and vet men have spent a season in Division 1. And so, the cross-country season comes to an end. Cross-country seems to be my best surface for some reason. I can beat some athletes who beat me easily on the road or track. Does that indicate that I don’t have the speed to compete on better surfaces, or that I am of a size or cadence that helps running through mud? Comparisons indicate that the tougher the conditions, the better my performance. There’ll be some mental aspect to it as well. I’m not phased by diabolical conditions, perhaps a result of running school cross-countries in equally diabolical conditions. And also, I always give my all, the most likely reason for retching at the end of most races. The combination of these might give me a mental edge over others when the going is tough. I am also very proud of my son for taking part and showing the same sort of desire to excel through the elements. It will stay with him for the rest of his life, as it has mine. Back to marathon training now. Six weeks to go until London. It was early December 2016 when I heard that I had been given a place in the 2017 London Marathon through the club places process. This was after having been rejected through the ballot process about eight times and my refusal to have to raise several thousand pounds for charity to do something that I do as a hobby – run. Does anyone ever ask a Sunday morning amateur footballer to raise money for charity in order to take part in a match? No. So why should runners be coerced into doing so to run? Off my soap box. That’s my point of view and I don’t expect everyone, indeed many people at all, will agree with me. This will be my third marathon after the inaugural Kielder Marathon in 2012 and the Yorkshire Marathon in 2014. I couldn’t have picked a much tougher marathon for my first. Kielder is beautiful, and very opportune for the largest man-made reservoir in Europe to be 26 miles in circumference, but there wasn’t a single flat bit on the course. Also, I didn’t really know what I was letting myself in for, got my nutrition all wrong and hit the wall majorly at 20 miles. 4 hours 12 or something was the result after having gone through half-way at 3.30 pace. My second marathon outing was much better. I knew how much energy I needed to take on board during the race and it was only a bit of cramp that got the better of me at 23 miles. I said I would be happy with anything under 3.30 and I finished in 3.29.52. But I know I can do better. My training and preparation was OK, but certainly not ideal. London is now the only marathon I would entertain doing at this time in my life. I’m enjoying the shorter races with the club, the cross-countries etc., and a marathon takes so much time to train for, substituting speedwork for long runs. So my target is not just a pb, it’s a good for age time and automatic entry, if I want, into next year’s event. For me, a 46 year old male by the time of the race, that’s sub 3.15. Now, from my first marathon to my second, I beat my time by over 40 minutes, but the first was a disaster and the second went quite well. Not perfectly, but I certainly didn’t lose 15 minutes in time in the last 3 miles. So, to hit my target time, means an average pace of about 7.15 per mile. More likely, 7.00 per mile to allow for slowing for drinks and food and losing up to a minute per mile in the last 6 miles when the marathon really starts. My half marathon times say it is definitely possible. A rule of thumb is double the half marathon time plus 10 minutes. My GNR time last year was 1.28. That makes a 3.06 marathon time. But it’s not automatic. You have to put the training in and a marathon is a totally different kettle of fish to a half-marathon. So my training started in earnest in December, extending my long runs to half marathon distance. January was difficult due to the cross-countries, but I hit 16 miles. February so far has seen me do a 19 and a 22 miler. In March I plan 24 and 26 milers and most of April is taper for the marathon on the 23rd. Ideally, I should get a 20 mile race in, but there’s no time or opportinity for that, so the quality of my training is important. One mistake that marathon novices make is to ignore the nutrition aspect during training. You still need to carb load in the days before a long run. You also need to ensure you take energy on board during your long run. It’s quite a logistical challenge. In addition to your long runs, your usual runs also need to be more challenging. For example, instead of a 5 mile easy Wednesday night, I have been extending to 8 miles tempo. My weekly mileage is peaking at 40, with an average of 30. I have got rid of the junk miles. Every run must have a purpose, whether it be long, interval, hill, recovery or tempo. I have also changed my diet. No more crisps or fizzy drinks and more carbs and protein. A combination of the better diet and higher calorie burn has seen my weight drop from 12 stone 4 just after Christmas to 11 stone 7 by mid-February. All this has coincided with some of my best performances in the Harrier League – definitely not a coincidence. The physical side is one thing. A marathon is also a mental challenge. Once you get your training above 20 miles, the prospect of a 26.2 mile marathon is mentally achievable. I always remember before I had done my first marathon, although I was a seasoned half-marathoner, my body was shot after a half. The thought of finishing a half and then turning around and doing it all again completely blew my mind. How could anyone do a full? Once you have worked your way up and got close to the distance in training, that mental block disappears. So, where is my training now with 8 weeks to go? Ideally, I’d have at least one more long run under my belt than I have done, and this weekend, there is the last Harrier League cross-country of the season which means a long run is out. But with two long runs done in the last two weeks, that’s no bad thing. My IT band in my left leg is starting to get tight, and you need to look after yourself during training. It’s actually almost an enforced rest, despite the fact I’ll still be running 6 miles up hills through ankle deep mud next weekend. My next long run will be a choice between up to 20 miles at race pace – I think I’ve decided on 7.00 minute miles – or 24 miles at between 7.45 and 8.00 pace. I’ve been fortunate this winter so far. The weather has been kind. Limited frosts – ice is the bane of every runner – and I’ve managed to dodge most of the rain. Still a month of winter to go though, so wood is being touched. I’ll post another marathon training update at the end of March. The morning of the 28th January started by hearing the torrential rain outside. Rain from the same weather front had dumped a bucket load on the north-west of England over the last 24 hours and that was where we were heading for the Northerns by coach, leaving Gosforth at 7am for the 4 hour drive to Knowsley Safari Park. We had a stop half-way for breakfast – a decent bowl of porridge for me – and arrived at Knowsley at 11.30am, just in time to see the u-17 girls finish. We chose a relatively dry place for our tent and went on a recce of the course. It wasn’t a spectacular course by any means – a long downhill followed by a long uphill. The animals had been moved though! It already looked cut up in certain parts and the day had barely started. We saw the u-13s, including a couple of casualties and, I’m sorry to say, pretty inadequate first aid cover at the far end of the course. The u-15s ran, followed by the u-17 boys, u-20s and the women and then it was time for the men. Being a championship course, it was longer than the usual Harrier League courses, 3 laps totalling just over 7 miles for the men. There were almost 700 in the field and, after several thousand pairs of feet had already traipsed around the course, reports from the ladies were that it was now a complete mudbath from start to finish. A lot of good-natured banter at the start line and the gun went, getting us going. This was a mass start – no pack handicaps in championship races and I was very much in the middle of the pack. Once off the starting straight, which wasn’t too bad, the course headed downhill through ankle deep mud. I tried to stick to the extreme left and the outside, where there was slightly better ground, but even that was rutted up. For the vast majority of the course, there was no escape. It was a full-on trudge. Most runners focus 20 or so yards in front of themselves, their brains sub-consciously looking for obstacles ahead, working out the best path, how their body needs to react to maintain speed, efficiency and poise. Not this run. It was heads down, working out where every single footstep was going to land, trying in vain to pick out a more efficient route. I couldn’t relax. My hands were gripped tight due to the mental concentration required just to stay upright. Coming to the end of the first lap, I was very downbeat. I wasn’t enjoying it, not one little bit. There was nowhere that you could actually stretch out into a rhythm and get some speed, one of the joys of running. I have to admit to feeling like dropping out. It was the longest two and a bit miles I think I have ever run. Needless to say, I didn’t drop out. I had identified a target, another runner in a green and white top, not from Gosforth, and was trying desperately, although not succeeding, to keep up with him. The condition of the course on the second lap was markedly worse than the first. Another 700 pairs of feet had been around, making their mark. A nightmare scenario for a cross-country runner is to lose their spikes, sucked off their feet by the mud. Mine were tied tightly, with tape wrapped around them. They weren’t going to come off, but you want to avoid your feet sinking so deep into the mud that you get that sucking feeling. It requires a lot more energy to pull your feet out of the mud when that happens. Normally I am very much a mid-foot striker but, when the mud is such that I feel the sucking effect, I try to forefoot strike more, landing on the balls of my feet and toes. I find this helps avoid the sucking effect and allows me to lift my feet easier onto the next stride. In most cross-country races, there may only be a few parts of the course where this is required. Here, it was every step. The result of so much of that though, was that the skin on the bottom of my toes of my right foot was becoming red-raw. Every stride was becoming painful, even if I returned to midfoot striking. As you can imagine, the third lap saw the course deteriorate even further, if that was at all possible. My left thigh started cramping through the exertion of lifting my leg out of the mud with each step. My left leg is always my weakness in running. It’s normally the one that gets injured, and is tight at the best of times. I started losing places like there was no tomorrow. Then, for the first time all day, the sun came out. Was it a glorious ephereal light that made the world look beautiful again? No, it was so low that it dazzled you, reflecting off the standing water on the course and making it even harder to pick the next step. But we were coming to the end. The last 600 metres was all downhill. Once again, I picked a target and told myself he was not going to beat me. The finishing straight was the best condition of the whole course and I stretched out as fast as my legs would take me. I was so relieved to cross the line. No retching this time. Aerobically, I could have done the whole thing again. Physically, however, my legs were shot. I headed back to the tent. I was the third Gosforth finisher and first vet. The two seniors who finished ahead of me were already there putting on warm clothes, comparing race stories very similar to mine. No real enjoyment, more of an ordeal. Other Gosforth runners started appearing, mostly relieved that it was over. One looked disorientated, heading off to the wrong tent before being called back. The traditional sharing of cake started, which makes everything so much better and the recovery so much faster. The results came out quickly due to the chip timing. I came 308th out of 670 odd. Slightly better than 50%. I’m still not sure whether that’s good, bad or indifferent. I just hoped that the lack of skin on my toes was not going to impact too much on my marathon training! There was no grass left in Tent City at all. It was just a sea of mud. We packed the tent away and laboured back to the coach. It only took us an hour to get out of the car park! Not the best of days in my running career. The overwhelming comparison was that I knew a small bit about what life must have been like in the mud of the trenches in the first world war. Without the guns, shells, disease and all the other horrors of that time of course. Now, we could get in a coach, crack open a beer and have a kip while a driver took us back home for a good night’s sleep. Nothing like the trenches at all then, and it’s a very disrespectful comparison to those who braved them, but those who ran that day know what I mean. A week after the last Harrier League race, the spikes were brought out again, nicely cleaned after last weekend’s exertions at Herrington Park, for the Durham Cathedral Relays, hosted by Durham City Harriers, on the grounds of the university. It’s a club, 2 mile relay of three legs, each leg going twice round a 1 mile course. The teams of three are determined by the club captain and I was given leg two of the veteran A team for Gosforth Harriers. It was a good club turnout for a wet Sunday morning with three male vets teams as well as a few female senior and vets teams and a male senior team. I arrived early with the club tent, just as the heavy overnight rain was coming to an end. It was wet, but standing water in only a couple of parts of the course. Our senior women’s teams put on a fantastic show, coming 5th, 7th, 19th and 61st. We do have a superb women’s team. Then it was the turn of the veteran men. I felt a bit lacklustre. It’s quite a physical job dragging the tent from the car and putting most of it up by myself, so I was already quite warm and a bit tired after a restless night’s sleep. I did a bit of a warm-up and started psyching myself up for the challenge ahead. Short races are different to longer ones as there’s less about conserving energy for the duration or hills and more about constant speed. You can’t make up time if you go off slowly in a short race. Our first leg runner, a GB triathlete, had a decent run, coming home in 9th place, just behind a Durham City Harrier. As he came in, I was ready for the official’s arm to go up, setting me off. I was about 10 yards behind the Durham runner and, within the first 200 metres, had passed him, moving us up to 8th place. Either I had gone off like a bullet, or he was a much slower runner than his team’s first leg runner. It turned out to be a bit of both, although I did modify my pace when I looked at my Garmin and saw a pace of 5.15 per mile for the first quarter mile. I felt good, much better than my demeanour before the start, but that was a little too quick. Going through a few clarty bits, I saw the runner in 7th place about 30 yards ahead. I was slowly gaining on him, a Sunderland Harrier. Sunderland are one of the strongest clubs in the Northeast, so it was a bit of a surprise to be gaining on one of their teams. It took a big effort through most of the second half of the first lap to get right up with him but I did it. My initial thought was to tuck in behind, recover a bit after the effort to catch up and then take him, but a combination of my momentum and realising he was not going as fast as me (sounds obvious) changed my mind and I continued the effort and passed him. It was now getting a bit confusing as I was starting to lap other runners. I was the second leg runner on my second lap. I was passing some second leg runners on their first lap, so you didn’t know if passing any of those runners was going to gain you a place. By the last 800 metres, I was starting to blow a bit. I caught an Elswick Harrier and another Sunderland Harrier and tried to wind it up for the approaching finish. Psychology is strange. If there had been someone to catch in front of me, I have no doubt I would have found some sort of sprint finish. But today, there wasn’t anyone, and I couldn’t find anything in my legs to do so. It might have given us another 2 seconds or so if I had. I crossed the finish line and our third leg runner took off and I did my now usual retching. It turned out that I had properly passed four runners to move us from 9th to 5th place, passing the Durham, Elswick and two Sunderland runners. That’s not bad. My time was 11.05 for a touch under 2 miles. I recovered, got some warm clothes on and went out to cheer our third leg runner and the other Gosforth teams. By this time, it was difficult to tell who was passing whom due to the amount of lapping going on. Our third leg runner was in a bit of a tussle with a much younger North Shields Poly runner. It was tight, with very little between them. Coming into the second half of the second lap, the Gosforth runner had put a real effort to overtake and hopefully run any sprint finish out of the Poly runner. 100 metres to go and I urged our runner for one last effort as I could tell the Poly runner seemed to have a bit in reserve. And that was the case. The Poly runner overtook our guy and beat him by a couple of seconds. It meant we came 7th out of 77 teams. A very creditable performance. But I couldn’t help feeling a bit guilty that a harder finish from me may have given us that extra couple of seconds to come 6th. It might not have made any difference, but I won’t allow that to happen again. I warmed down and put in another couple of slow miles while supporting the Gosforth teams in the senior men’s race and chatting to team mates about future races. A weekend off competition next weekend and then the Northern Cross-country Championships in Liverpool the weekend after. With the Christmas break nothing more than a distant memory, the first Saturday in January saw the Harrier League congregate at Herrington Park in Sunderland for the fourth race of the season. I had never run here before, but I had seen videos on YouTube of the National Cross-Country championships held there in driving snow a few years before. It’s fairly exposed, a few hills, but nothing extreme. However, despite a comparatively dry winter so far, the mud in many places was pretty deep, perhaps due to a lake nearby and the subsequent high local water table. Weather conditions were pleasant – no rain, a light wind and not especially cold. The top 10% of finishers in each race are promoted to the next fastest pack: slow to medium and medium to fast. After a few near misses for promotion to the medium pack, I was once again starting from slow. Having got over a Christmas cold and off the back of some great weeks’ training, this was my race to give it everything and score as low as possible for the club, which would hopefully mean personal promotion to the medium pack if all went well. Certainly my club colleagues were telling me it was going to be my day. I managed to claim a place at the front of the mass start and was leading for the first hundred metres or so. I found my rhythm and was passed by eight or so speedsters as the field started to stretch. It’s good to start at the front, so that you can count your position in the field – important for the mental pack promotion calculations. You can never be certain how many will be promoted as it is a percentage of the field, but it’s good to know. The course took us through a gate and onto a narrow trail which was going to cause a bit of havoc when the bulk of a very big field of 532 runners tried to squeeze through it so early on. A good race to be at the front. After the first mile, I was in about 14th place when the first hill came into view; a long, steady climb. Remembering words of wisdom from a club colleague, I didn’t bust the gut, and use a lot of energy, to get up it. I took it easy, was overtaken by one other, much younger athlete in particular who was powering up it. Over the crest, there was a downhill, equally long and steady when I opened up, came steaming down it, overtaking the athlete who had passed me on the hill and putting 20 yards between us. The next hill, the same thing happened. My favourite part of the course was through the woods. The entry to the path was blocked by two fallen trees very close to each other. Taking the fastest route, if you jumped to get over the first tree, you were likely to hit your head on the second, so the best course of action was to do a weird jump and duck at the same time. At the end of the woods, you hurdled a low stile, took a sharp left past the main bulk of spectators and onto the second lap. I was in about 16th place, still felt good and was not losing any more places to the other slow pack runners. The club’s head coach was on the first hill, encouraging me to relax, try to get in touch with a couple of runners 10 yards in front of me and stretch out going down the hill towards the worst of the mud. Words of support always spur me on, although today, there weren’t too many spectators on this part of the course as it was a long way from the tents, so his presence was very much appreciated. Through the woods again and onto the third lap. The club secretary was taking photos on the narrow trail. When I saw the one she took of me afterwards, I was shocked. It was a fairly long distance shot, but there was no one else in the picture, either in front or behind me, just proving how much the field had stretched out. I was starting to feel the pace. Going up the hills, I was passed by some medium and fast pack runners who had made up their 2.30 and 5.00 minute handicaps respectively. My legs were labouring up the hills and I could feel my shoulders and neck tensing up. I was losing ground to, and being overtaken by, the odd slow pack runner as well. I used the downhill to loosen up, get a bit of momentum back and stem the tide, and I only lost another couple of places. As I was on my final lap, I turned right out of the woods instead of left and into the last quarter mile or so to the finish, slightly uphill. Going into the last 200 metres I kicked, but was still overtaken by the same athlete I was battling with up and down the hills on lap 1 – so annoying. I could hear someone else closing on me in the last 100 metres, so I kicked again and managed to hold them off – a fast pack runner as it turned out. My, by-now-usual, action after crossing the finish line – retching my guts up – happened, but nothing came out this time. I finished in 27th place, my best Harrier League finish by quite a distance and the first Gosforth Harrier home. It meant certain promotion to the medium pack for me for the rest of this season and the whole of next. A quick analysis of the results afterwards was interesting. I had put big chunks of time between myself and some other runners normally quite close to me, but heard stories of difficulties getting so many runners through the narrow bits of the course to the extent that some had to stop at times. As I said, a good race to be out in front. Taking the pack handicap out of the equation, I was 93rd fastest overall and 6th out of 78 in my age group. The club coach made a point of saying well done to me afterwards, that he thought I had gone off too fast and wouldn’t be able to hold it together. But I did, for the most part. Had I spent too much energy on the first two laps? Would I have finished further up or further back if I had taken it slightly easier, saving more for lap 3? How do I avoid retching at the end? I’ll never know the answers to the first two questions, but I’ll do more investigation on the third. The personal tactical and strategic intricacies of distance running are an uncertain science with so many variables. It’s one of the things about it that I love. Opposing the elements, the terrain, other athletes, your own head and the fallibility of your own body, you have your natural running ability and style, the training you have done and pure guts and determination. Our next outing is the Durham Cathedral Relays next weekend. A totally different event, with exactly the same variables as above, but perhaps in a different order! Having grown up on the clay soil of South-east England, mud and cross-country go hand in hand. 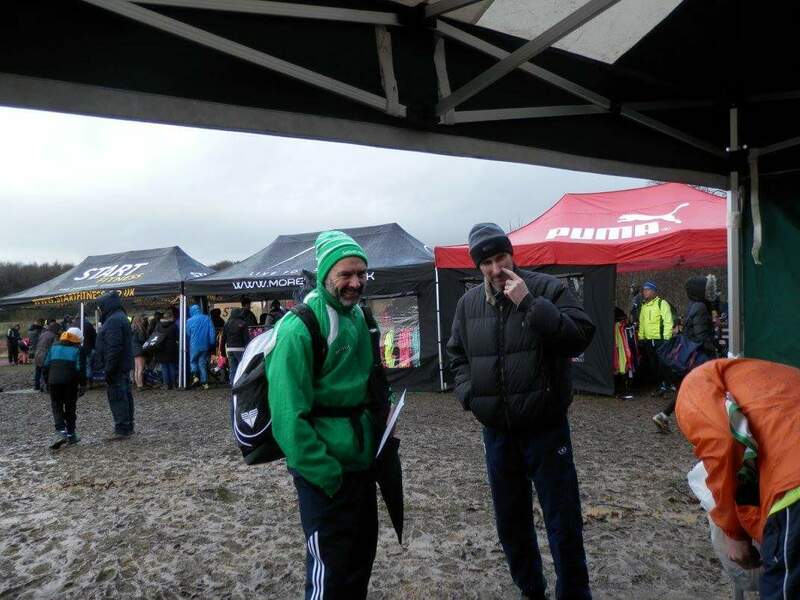 However, add a biting north-easterly and a wintry mix of rain, sleet and hail throughout the whole day, the going on Saturday for the fifth Northeast Harrier League race was ‘challenging’. Add the hills and valleys of the beautiful Thornley Hall Farm and the word most used on Saturday was ‘brutal’. With the tent up, marshalls in place, including several Gosforth Harriers, the first junior races got under way. First aid provider and spike retriever were added to the marshall job description as runners slid and splashed their way around the tough course. Several sprained ankles and even a broken leg kept the first aiders more than busy. The route went straight through the middle of Tent City – a brilliant concept that benefitted both supporters and runners. The grit and determination showing on the face of every athlete in the smaller than usual fields was evident and an absolute requirement just to get round the course. And so, time for the men’s race came around. A quick five minute warm-up replaced the usual half hour of striding and stretching and I took my place in the medium pack for the first time. This meant starting two and a half minutes after the actual start of the race. You could sense a higher than normal level of tension in the field as we stood waiting for the whistle to set us off, with gusty showers of freezing rain hosing down on us. I identified my target to beat – another vet runner from a club at the wrong end of Division 1 who generally finishes very close to me in every race. Sometimes I win; sometimes he wins; let’s see what happens today. And then we were off. I was feeling pretty good actually; strong, hitting the right pace and effort levels quickly as I got to the first hill, right alongside my target. Yes, the mud was thick, but in some places there were still options less thick than others, although this was only the first lap. I love running downhill, just letting go and letting gravity help you down. At the bottom of one particular downhill, a left hand turn through a gate, I was struggling to slow down so grabbed the gatepost to help me turn and maybe get a slingshot effect as well. Note to self: don’t do that when there is barbed wire on the post. Result – blood pouring from quite a deep cut on my finger. My target pulled away as a monkey on my back told me that this would be a good excuse to drop out, head back to the tent and put some nice warm clothes on. It got worse as I started climbing the hill heading back towards the tent. But then I was hit by a wall of noise on both sides. Supporters cheering, shouting, encouraging, driving you up and over the crest. I heard my name several times from the non-running supporters, as well as Gosforth ladies and juniors, who had stayed behind after their race was finished to cheer us on. No more thoughts of pulling out, just to get back in touch with my target. Lap 2 was tougher. Fewer escape routes after another 380 or so pairs of feet had been through it. I caught my target on the hill up the side of the field after he chose a much longer, albeit less muddy route; passed him and didn’t see him again. I was in a good place, powered up the hill into the woods and once again through Tent City to more support. Into lap 3, and perhaps due to the effort, perhaps the exposure, or a combination of both, I started feeling light-headed. Not the wake up in the first aid tent type of light-headedness, but light-headed nevertheless. I felt like there was no way I could have stopped myself falling over if I encountered a bad skid. The wind and rain had picked up on the most exposed part of the course and my post-run analysis showed that I slowed down by a good 30 seconds for mile 5. Mile 6 started by getting a traditional gentle bum-rap from a fast pack Gosforth senior as he passed me. A first for me which, in a funny way, spurred me on. Two big climbs to go, through an even more raucous Tent City for the last time and then a long drag to the finish line. Time to extract the last dregs of energy down the home straight with words of encouragement from another club colleague walking back to the tent having already finished. At this point, I’d normally be scanning who was in front of me; any Division One runners within striking distance? There was no sprint finish left in me today though. I looked back to make sure I wasn’t going to be overtaken and crossed the line, completely exhausted. No waiting around for other Gosforth teammates to finish at this race; straight back to the tent, via First Aid to get my hand cleaned up. So many people ask me why I do this. Incredulous at the thought of what we put ourselves through, the conditions we run in, for enjoyment. But even on days like today, especially on days like today, the sense of satisfaction, pride in yourself and every member of your team who turned up, ran and finished shines through the dark skies and the endorphins last long into the night. Scanning the results, I was happy with my efforts. 80th position overall out of 378, and that with the handicap from medium pack. I beat my target, got close to some people who are normally a lot faster than me and I know that I gave everything. Probably our best performance as a team all season as well. Unfortunately, other teams around us in the table also had very good days, so we actually ended up losing ground. We’ll meet again in Alnwick on March 4th for another run amid more spectacular scenery. Looking forward to it. My Running Blog Blog at WordPress.com.